Disappointing, especially after the rumors fed by the Airpods manual. I’d be interested in knowing more about Apple’s challenges. … as a heads up in evaluating other companies devices. 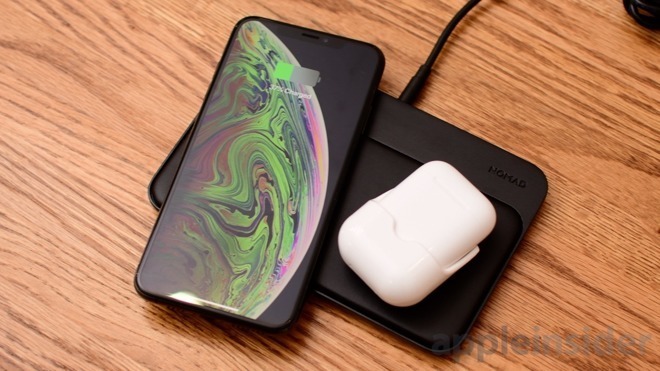 It’s too bad, since I was considering getting AirPods soon and probably would have spring for the version with the wireless charging so I could easily charge my XSmax and AirPods (and who knows, maybe even Watch eventually) overnight. I suppose I could still do that with another product, but that will require some research now, along with some deep skepticism about those chargers’ abilities given Apple’s retreat from the product category. I suspect Apple could just not get its sweet monster margin (thats the standard they are speaking about). All reports are that the technology problems could not be solved. Matthew Panzarino at TechCrunch write, "Everything I’ve personally heard (Apple is saying nothing officially) about the AirPower delay has been related to tough engineering problems related to the laws of physics. Specifically, I’ve heard that they ran too hot because the 3D charging coils in close proximity to one another required very, very cautious power management." I agree with John Gruber, who wrote, "Somebody looked at the technical hurdles AirPower still faced in September 2017 and convinced the executive team that they’d figure it all out, and it was safe to announce. Because they’re Apple, and they always figure these things out. And there were other people who looked at AirPower’s multi-coil design and said it was unlikely to ever work safely. The wrong side won that argument." RIP AirPower. You shall be remembered forever. I have a few Qi charging stations now (the Mophie partnership station that Apple first started selling IS the best of all brands I’ve tried), a couple in my home, one at work. I was REALLY looking forward to getting AirPower and the updated AirPods. I was holding out for the new AirPods, despite the fact mine are getting around 40-ish minutes per charge. Nomad makes a multi device Qi charger. I love mine. Grovemade makes a great Qi charger too. A sophisticated wireless charger with a multi-port USB charging hub underneath. Capable of charging up to 5 devices at once and designed to blend into your home’s decor. I’ve tried several wireless charging solutions and unless I take my phone out of the case (Apple folio), none have fully charged my phone overnight. I’ve returned them all as I don’t want to damage the case by removing the phone every day. Please note that all AirPods that Apple are now selling would be the Gen 2 model. The options are whether one gets the standard case or the Qi charging case; the AirPods are the same regardless. One does, however, need to be careful when buying from other vendors if they want the Gen 2 (i.e. with Hey Siri) AirPods with the standard case. I figured it would come to this, looking for alternatives to get the desired result. Edit: more than they already have, I mean.